When it comes to ubiquitous utility in the service of street safety, orange traffic cones stand alone… except when they stand together and someone deigns to call the result Art. 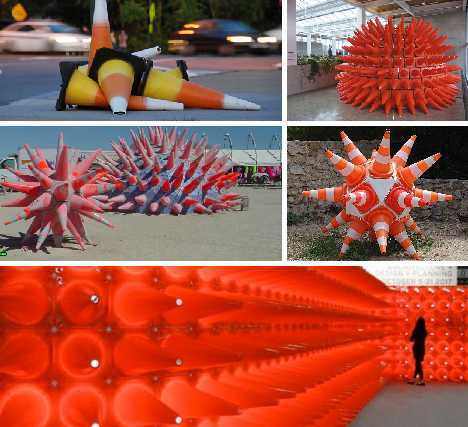 Traffic cone art goes far beyond what the designers of these plastic pyramids planned on but you’ve gotta admit, cones alone or in an artistic assemblage succeed equally in attracting our attention. 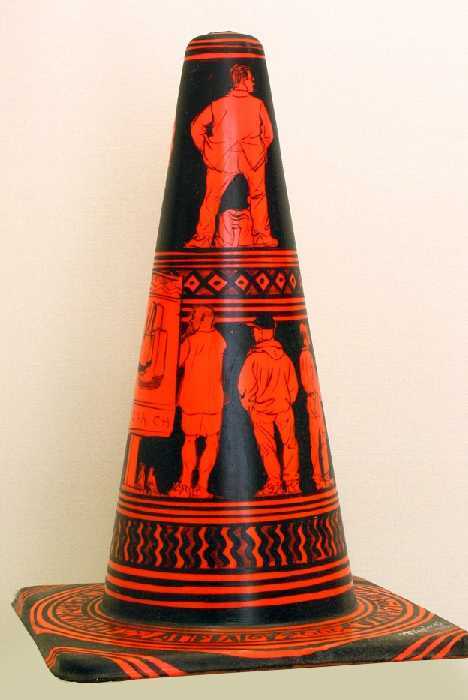 Yours truly actually had a Traffic Cone Lamp, handed down to me by my child-of-the-sixties cousin. Used with a 40-watt incandescent light bulb (not recommended, by the way), the Tangerine Triangle cast a warm glow eerily complementary to the complex chords of progressive rock… ah, misspent youth! It’s a cone, it’s a lamp, but is it art? Who knows, who cares, who can be troubled with materialistic labels, man, when it’s always sunset (or sunrise) in your happy place. 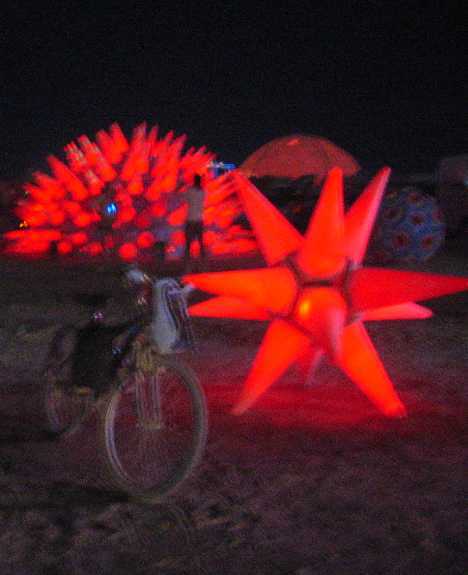 The Traffic Cone Art Camp on the Playa appeared at Burning Man in 2002, 2004, 2005 and perhaps more. 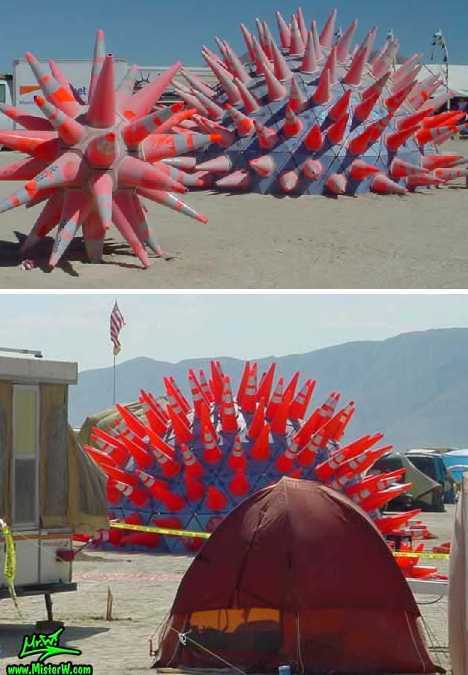 Some call the cone-encrusted dome a Traffic Cone Urchin but c’mon… sea urchins in the middle of the Nevada desert? See that glow? Looks (and smells) like they used incandescent light bulbs. Now remember y’all, Burning Man is an eco-friendly festival that encourages players to play nice on the playa. That means LNT of your visit, leave no MOOP and take comfort in knowing what happens at BRC, stays at BRC. Scenes of city life play out on and around a series of orange traffic cones, an oddly ideal medium if there ever was. Yianni Nomiko gives us these… dare I say “iconic” vistas using little more than some blackout paint and a considerable dose of creative imagination. 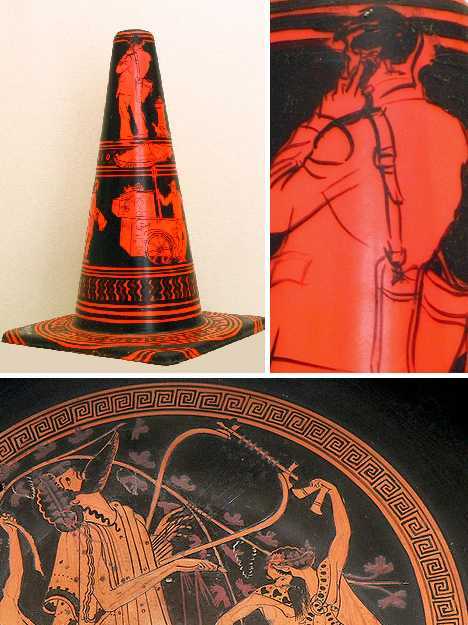 They may be 2,500 years removed in time, but Nomiko’s unique creations uncannily resemble the renowned Red-figure Vases of Classical Greece. Must we wait a further two and a half millenia for the former to eclipse the value of the latter? Does naming oneself “Diabetik” for artistic pursuits somehow conflict with creating traffic cones that look like Candy Corn? Perhaps, but just imagine the sugar shock drivers in the Washington DC metro area sustained when they encountered his work around Halloween of 2009. 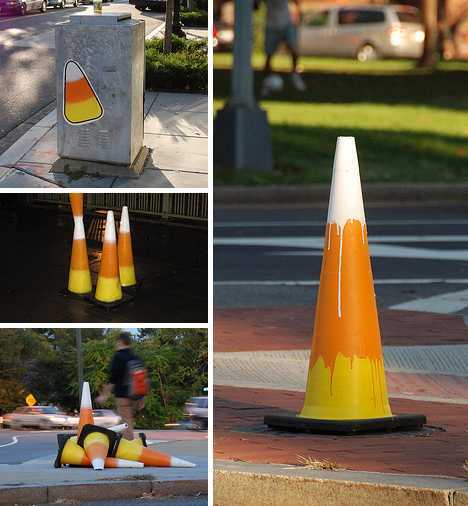 Candy corn traffic cones… a tasteful concept to be sure. In related news, kids building city scenes from LEGO are decorating their urban brick blocks with actual Candy Corn candies acting as traffic cones. This art cone car is a larger than life example of car cone art, or vice versa. 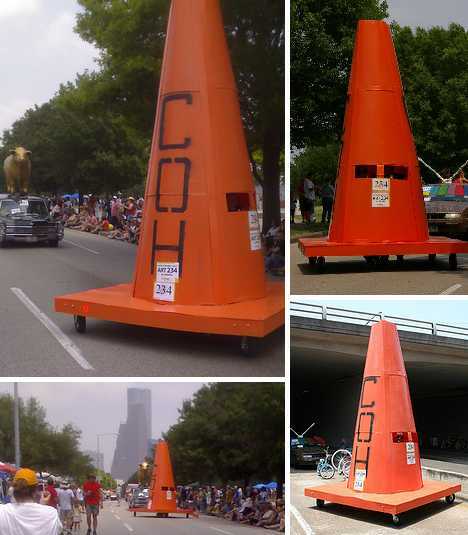 Emblazoned with “COH” for “City Of Houston”, the so-called “King Cone” was Emily Sloan’s entry in the 2008 Houston Art Car Parade. I’d say it stopped traffic but that would be redundant. 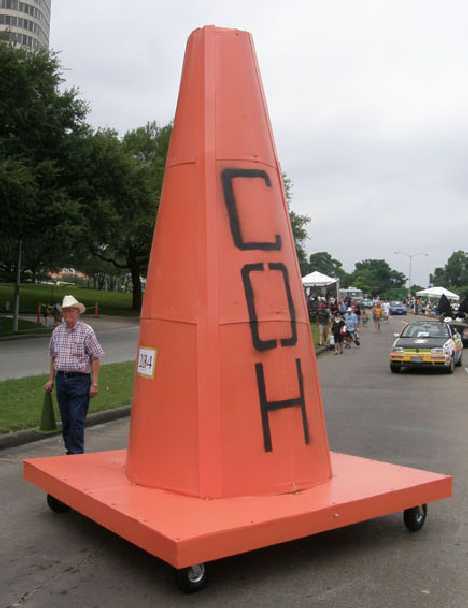 Sloan describes her comical, er, conical creation as being “a monument to the traffic cone.” Actually it’s a monument AND a traffic cone, an inanimate testament to the old adage that everything’s bigger in Texas. 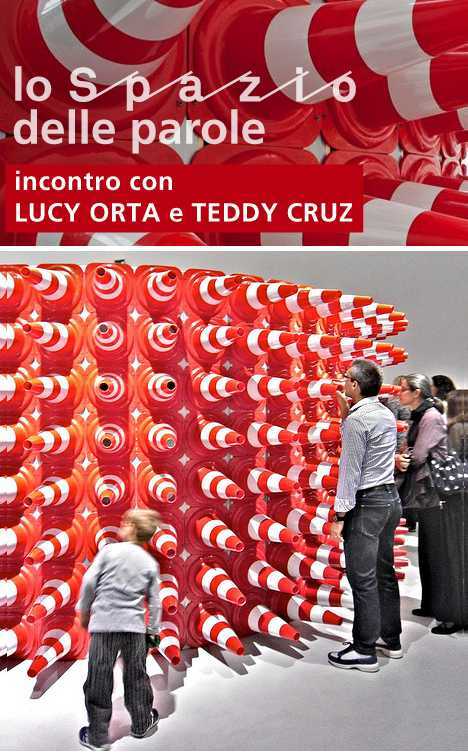 Cruz also offers us another way of looking at traffic cones: from the inside out. His “Cone Room” combines a warm and welcoming, softly glowing orange interior with a sharp, pointed, exclusionary exterior. So you’re getting your three squares, good for you! 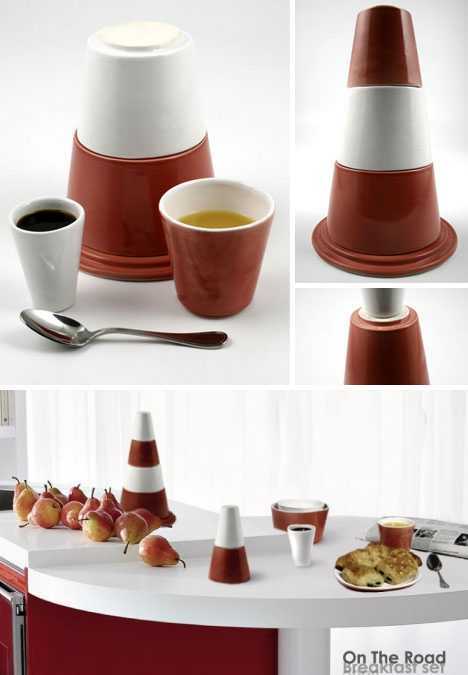 Take time out for a triangle, courtesy of Pierre Lescop and his whimsical “On The Road” ceramic breakfast set. 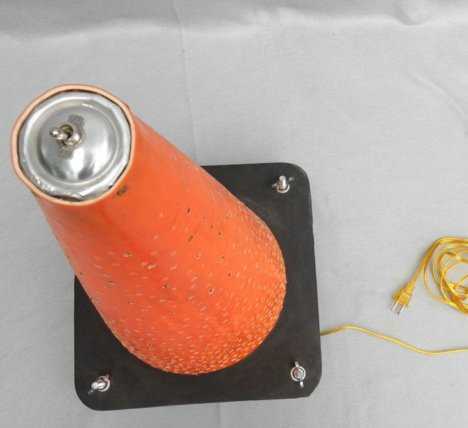 You’re not likely to see it at the local drive-thru but that’s fine: this is one cone you want to encounter before you hit the road, not after. 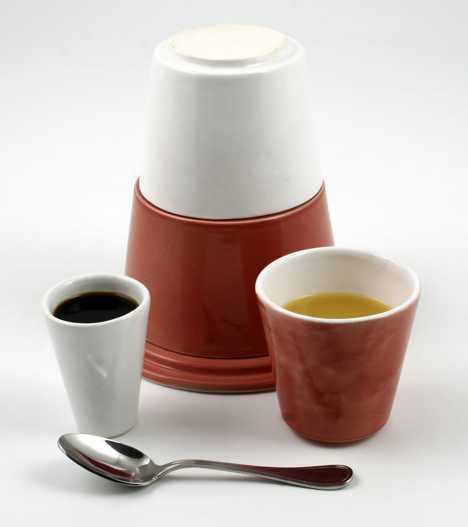 “On The Road” is made entirely of white and orange ceramic with different solid color sections forming an espresso cup, juice glass, tea cup, bowl and plate. Basically it’s all you need for the preparation of a full breakfast. When washed and dried, the segments reassemble into a remarkably space-saving configuration. Lilian Bourgeat likes to scale up everyday objects and what could be more “everyday” than the humble orange traffic cone? 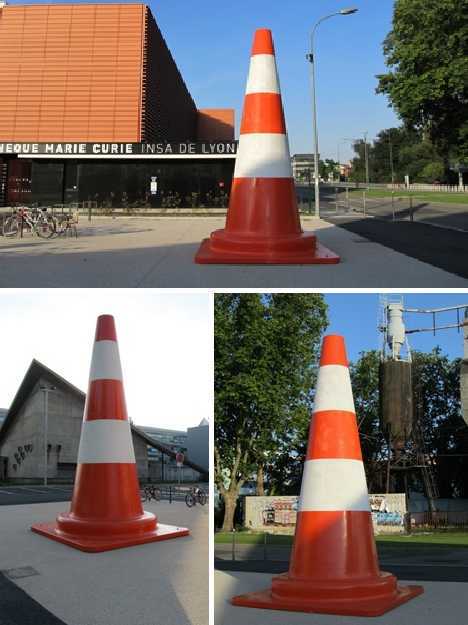 “Le cône de chantier” (The Cone Construction) sat around the campus of the INSA de Lyon, Frances foremost school of engineering, in the summer of 2010. 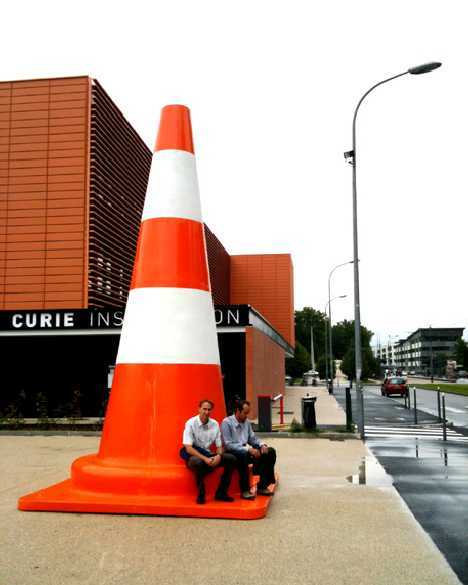 One wonders how many standard-size traffic cones could be cast if Bourgeat’s cone of cones was melted down? 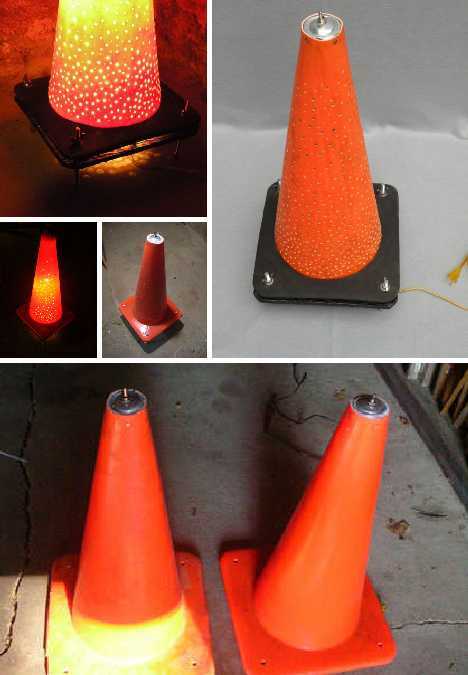 Put another way, how many standard-size traffic cones would have to be melted down to create a duplicate to Bourgeat’s cone of cones? Let’s leave that nugget with the engineering students at the INSA de Lyon, who think they’re so smart. What began as a (likely drunken) prank back in 1980 has gradually grown into a tradition though it’s rare the Duke’s horse is similarly honored. 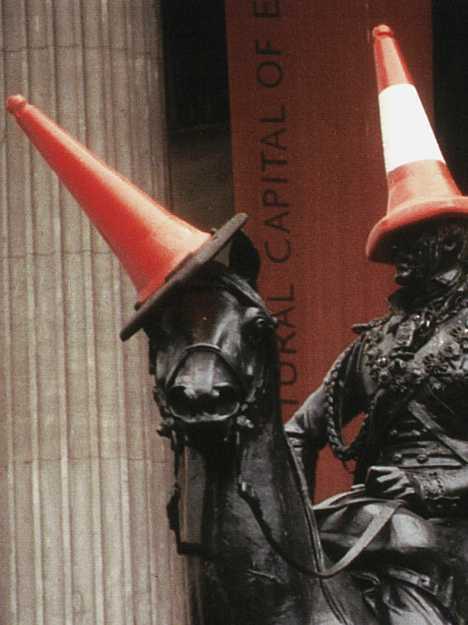 Glasgow police no longer bother removing the cones though they have issued a plea for citizens to refrain from placing them there – both for their own protection and for that of the A-listed, 160-year-old statue. 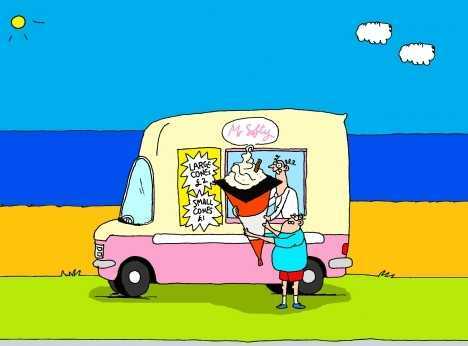 What the heck, guv’ner, it’s better than pigeons wot? Thinking of adding some spice to your art? 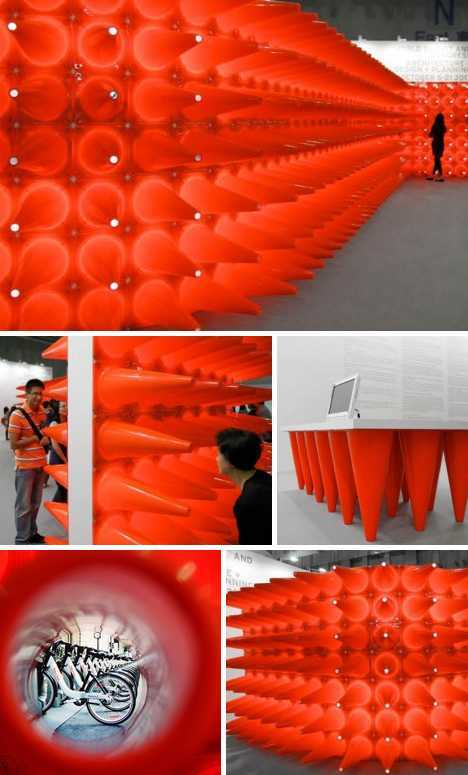 Start with Paprika, who is/are responsible for the above massive accumulation of traffic cones displayed at the World Summit and Congress of Architecture at the Design Expo in Taipei. We’re not sure exactly how many traffic cones Paprika “co-opted” for use in their display but suffice to say, road construction in Taipei pretty much ground to a halt during the Expo. 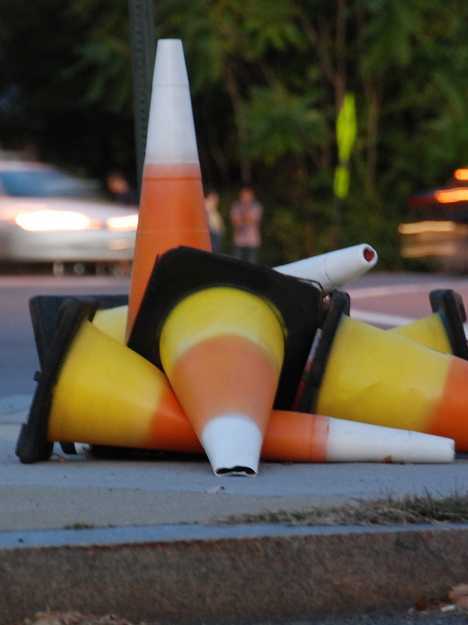 Traffic cones are almost omnipresent in today’s constantly changing urban environment and although they may show slight variations in design, they remain one of the most universal cogs in our engine of construction, demolition and reconstruction. 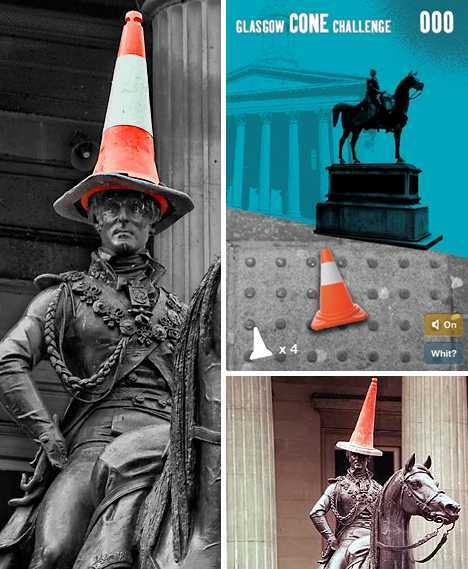 No surprise, therefore, that traffic cones have emerged as an evocative way to express modern themes of progress, alienation and urban culture. Now if only they came upside-down, with ice cream on top.